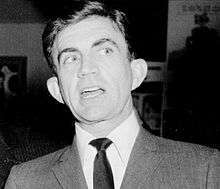 Blake Edwards (born William Blake Crump; July 26, 1922 – December 15, 2010) was an American film director, screenwriter and producer. Edwards began his career in the 1940s as an actor, but he soon began writing screenplays and radio scripts before turning to producing and directing in television and films. His best-known films include Breakfast at Tiffany's, Days of Wine and Roses, 10, Victor/Victoria and the hugely successful Pink Panther film series with British comedian Peter Sellers. Often thought of as primarily a director of comedies, he also directed several drama, musical and detective films. Late in his career, he transitioned to writing, producing and directing for theater. Born William Blake Crump in Tulsa, Oklahoma, he was the son of Donald (c.1890-????) and Lillian (Grommett) Crump (1897-1992). His father reportedly left the family before he was born. His mother married again, to Jack McEdwards, who became his stepfather. McEdwards was the son of J. Gordon Edwards, a director of silent movies, and in 1925 he moved the family to Los Angeles and became a film production manager. In an interview with the Village Voice in 1971, Blake Edwards said that he had "always felt alienated, estranged from my own father, Jack McEdwards". After attending grammar and high school in Los Angeles, Blake began taking jobs as an actor during World War II. Edwards served in the United States Coast Guard during World War II, where he suffered a severe back injury, which left him in pain for years afterwards. Edwards' debut as a director came in 1952 on the television program Four Star Playhouse. In the 1954–1955 television season, Edwards joined with Richard Quine to create Mickey Rooney's first television series, The Mickey Rooney Show: Hey, Mulligan, a sitcom about a young studio page trying to become a serious actor. Edwards's hard-boiled private detective scripts for Richard Diamond, Private Detective became NBC's answer to Sam Spade and Philip Marlowe, reflecting Edwards's unique humor. Edwards also created, wrote and directed the 1959 TV series Peter Gunn, which starred Craig Stevens, with music by Henry Mancini. In the same year Edwards produced, with Mancini's musical theme, Mr. Lucky, an adventure series on CBS starring John Vivyan and Ross Martin. Mancini's association with Edwards continued in his film work, significantly contributing to their success. Operation Petticoat was Edwards's first big-budget movie as a director. The film, which starred Tony Curtis and Cary Grant, became the "greatest box-office success of the decade for Universal [Studios]," and made Edwards a recognized director. Breakfast at Tiffany's, based on the novel by Truman Capote, is credited with establishing him as a "cult figure" with many critics. Andrew Sarris called it the "directorial surprise of 1961", and it became a "romantic touchstone" for college students in the early 1960s. Days of Wine And Roses, a dark psychological film about the effects of alcoholism on a previously happy marriage, starred Jack Lemmon and Lee Remick. It has been described as "perhaps the most unsparing tract against drink that Hollywood has yet produced, more pessimistic than Billy Wilder's The Lost Weekend". The film gave another major boost to Edwards's reputation as an important director. Edwards's most popular films were comedies, the melodrama Days of Wine and Roses being a notable exception. His most dynamic and successful collaboration was with Peter Sellers in six of the movies in the Pink Panther series. Five of the those involved Edwards and Sellers in original material, while Trail of the Pink Panther, made after Sellers died in 1980, was made up of unused material from The Pink Panther Strikes Again. He also worked with Sellers on the film The Party. Edwards later directed the comedy film 10 with Dudley Moore and Bo Derek. Darling Lili, whose star, Julie Andrews, Edwards later married, is considered by many followers of Edwards's films as "the director's masterpiece". According to critic George Morris, "it synthesizes every major Edwards theme: the disappearance of gallantry and honor, the tension between appearances and reality and the emotional, spiritual, moral, and psychological disorder" in such a world. Edwards used difficult cinematography techniques, including long-shot zooms, tracking, and focus distortion, to great effect. The film failed badly, however, at the box-office. At a cost of $17 million to make, few people went to see it, and the few who did were unimpressed. It brought Paramount Pictures to "the verge of financial collapse," and became an example of "self-indulgent extravagance" in filmmaking "that was ruining Hollywood." In 2003, Edwards received an Honorary Academy Award for cumulative achievements over the course of his film career. Having grown up in Hollywood, the step-son of a studio production manager and step-grandson of a silent-film director, Edwards had watched the films of the great silent-era comedians, including Charlie Chaplin, Buster Keaton, Harold Lloyd, and Laurel and Hardy. Both he and Sellers appreciated and understood the comedy styles in silent-films and tried to recreate it in their work together. After their immense success with the first two Pink Panther films, The Pink Panther (1963) and A Shot in the Dark (1964), which adapted many silent-film aspects, including slapstick, they attempted to go even further in The Party (1968). Although the film is relatively unknown, some have considered it a "masterpiece in this vein" of silent comedy, even though it included minimal dialogue. Edwards married his first wife, actress Patricia Walker, in 1953. They had two children, and divorced in 1967. She appeared in the comedy All Ashore (1953), for which Edwards was one of the screenwriters. Edwards' second marriage from 1969 until his death was to Julie Andrews. Andrews had a daughter, Emma, from her previous marriage, and the couple adopted two orphans from Vietnam in the early 1970s, Amelia Leigh and Joanna Lynne. Andrews appeared in a number of his films, including Darling Lili, 10, Victor/Victoria and the autobiographical satire S.O.B., in which Andrews played a character who was a caricature of herself. In 1995, he wrote the book for the stage musical adaptation of Victor/Victoria, also starring Andrews. On December 15, 2010, Edwards died of complications of pneumonia at the Saint John's Health Center in Santa Monica, California. His wife and children were at his side. His death came after fifteen years of suffering from chronic fatigue syndrome and depression. It has been difficult for many critics to accept Blake Edwards as anything more than a popular entertainer. Edwards' detractors acknowledge his formal skill but deplore the absence of profundity in his movies. Edwards' movies are slick and glossy, but their shiny surfaces reflect all too accurately the disposable values of contemporary life. Others, however, recognized him more for his significant achievements at different periods of his career. British film critic Peter Lloyd, for example, described Edwards, in 1971, as "the finest director working in the American commercial cinema at the present time." Edwards' biographers, William Luhr and Peter Lehman, in an interview in 1974, called him "the finest American director working at this time." They refer especially to the Pink Panther's Clouseau, developed with the comedic skills of Peter Sellers, as a character "perfectly consistent" with his "absurdist view of the world, because he has no faith in anything and constantly adapts." Critic Stuart Byron calls his early Pink Panther films "two of the best comedies an American has ever made." Polls taken at the time showed that his name, as a director, was a rare "marketable commodity" in Hollywood. For someone who wants to practice his art in this business, all you can hope to do, as S.O.B. says, is stick to your guns, make the compromises you must, and hope that somewhere along the way you acquire a few good friends who understand. And keep half a conscience." ↑ "Receiving Honorary Oscar in 2004". Youtube.com. Retrieved September 7, 2012. ↑ "Telegraph obituary". London: Telegraph.co.uk. December 16, 2010. Retrieved September 7, 2012. ↑ Feiwell, Jill (December 12, 2003). "Life Oscar to Edwards". Daily Variety. Retrieved 21 January 2015 – via HighBeam Research. (subscription required (help)). 1 2 3 Moody, Mike (December 16, 2010). "Filmmaker Blake Edwards dies, aged 88". Digital Spy. Hachette Filipacchi (UK) Ltd. Retrieved December 16, 2010. ↑ "Blake Edwards:Old School" Archived December 14, 2010, at the Wayback Machine. Directors Guild of America Quarterly, Summer 2009. ↑ "Blake Edwards, American director, dies aged 88". BBC News. BBC. December 16, 2010. Retrieved December 16, 2010. ↑ "Clips from ''The Party''". Youtube.com. January 22, 2009. Retrieved September 7, 2012. ↑ Thomas, Kevin (May 30, 2002). "Tarr's 'Harmonies' Is Involving Puzzle The tale of a man's encounter with irrational forces will get three showings at LACMA". Los Angeles Times. Los Angeles, CA: Los Angeles Times. Retrieved March 6, 2010. ↑ Harmetz, Aljean (December 16, 2010). "Blake Edwards, Prolific Comedy Director, Dies". The New York Times. The New York Times Company. Retrieved December 16, 2010. ↑ "Julie Andrews' husband Blake Edwards, 88, dies of pneumonia". Daily Mail. London. Wikimedia Commons has media related to Blake Edwards.